SurveilStar is a dedicated PC/Internet Monitoring software company based in Montreal, providing professional solutions for business, education, government and even home users. Under a fiercer and fiercer commercial competition circumstances, employee productivity improvement and data leakage prevention become more and more important, employers need to know how their employees make use of their PCs and what they are doing on the Internet. SurveilStar provides a complete and powerful PC/Internet monitoring software to achieve. Internet connects the whole world, and more and more young kids are using Internet to communicate. However, there are also many porns, violence and frauds that will bring kids mental hurt. Parental control software is necessary. 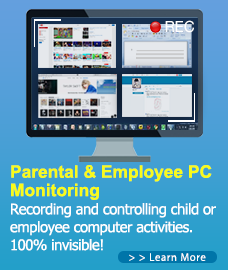 SurveilStar is the ideal parental control tool. SurveilStar records and controls all computer and Internet activities – emails, web sites, chats and instant messages, program activities, document operations, movable devices, printers, and many more. You can watch real-time screen snapshots and stop sabotage or data theft in time.